Often, it's a fireplace's faux or natural color that makes it the daunting dated or unattractive downer in the room, not the bricks themselves. Choosing a new color, however, isn't as easy as thumbing through paint swatches, and lugging home a gallon of 100-percent acrylic paint in your favorite shade and a thick-nap roller to apply it. 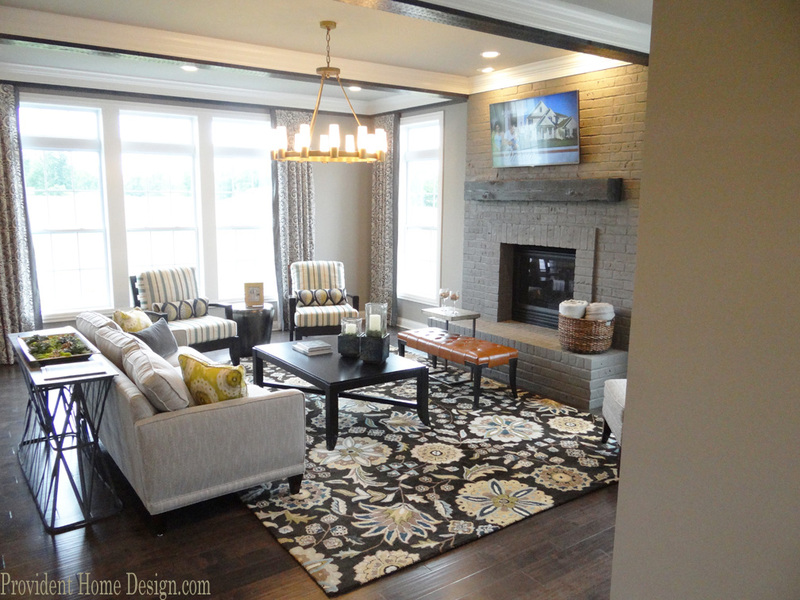 The room's scheme plays a role as do your style and updating desires when you're choosing a new fireplace hue -- or two. Experiment on spare bricks to achieve a pleasing aged or toned-down effect. If your decor daydreams include old-fashioned libraries, gilded-gold frames surrounding tasteful nudes from centuries past, or French farm tables encircled by distressed chairs, then a classic fireplace color is likely going quench your design thirst. Paint colors that appear elegantly aged include warm brown, goldenrod or even dark blue-gray. If the fireplace's original dark-red coloring simply seems too bossy, tone down its effect -- and artificially increase its age -- by painting it with thinned-down paint or with a lime-and-salt whitewash treatment, leaving hints of red to peek through. 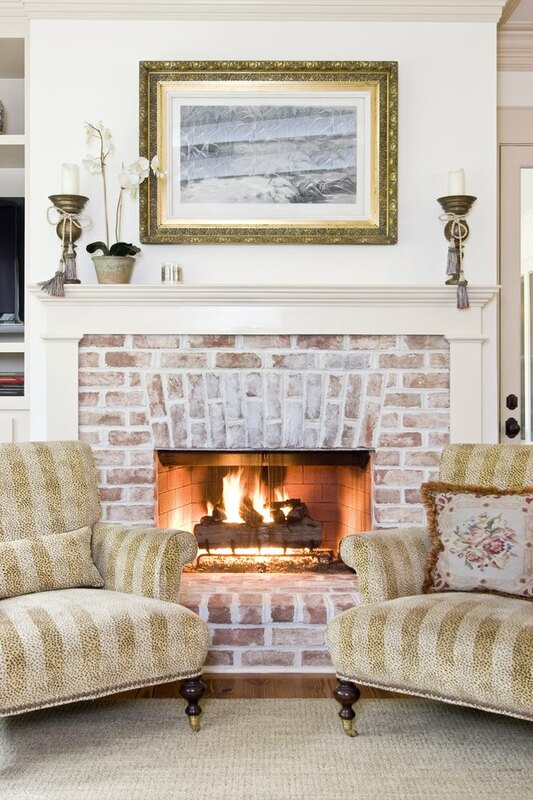 A quick way to bring an old brick fireplace into the current decade is to paint it a bold color. For something unexpected, use a high-gloss or metallic shade. If you have adventurous taste and are drawn to primary colors, go with bright yellow, electric blue or cherry red for impact. When you're after an urban-chic atmosphere, paint the bricks attention-grabbing aqua, petal pink or jelly-bean green, adding whimsy and eclecticism. White may be the go-to fireplace color when you prefer minimalist style or a tone-on-tone pale scheme. But white -- especially off white -- can make a dated home appear even older since it was a popular mid-21st century fireplace stone color. For a more timeless look, opt for light, mid or dark gray, light or mid brown, gray-beige or taupe. To give the fireplace a mottled effect, cut a couple of sponges to brick-size, and use them to dab light- and mid-neutral paint on random bricks. When you think "brick," rustic rusty red likely springs to mind. If your fireplace is already brick red -- and should fit your rustically styled room -- but seems off-putting, look a little closer. It may be the grayish-charcoal-colored or downright-dirty grout that throws off the pastoral effect. Before working white, gray or cream-colored paint into the easy-to-follow grooves with a narrow paintbrush, clean the whole unit, from the top down. A vacuum cleaner removes dust and loose bits, while warm, soapy water should wipe away soot stains.